A school bus from the District of Columbia Schools burst into flames as it travelled on North-Bound Baltimore Washington Parkway near the Annapolis Road exit in Landover. No students were on-board and the driver escaped safely. The bus was well involved and required about 20 minutes to completely extinguish. A passing motorist captured video as the incident unfolded. A press conference with just about every print, television and radio media outlet in the Washington-Baltimore Region present to document this important day, Volunteer Sergeant Kevin O'Toole stepped outside of the hospital for the first time since he was admitted 55 days ago. A significant day in Kevin's recovery; being discharged from the hospital and starting the next phase as an out patient for the next several months. Kevin O'Toole, 21 years of age, has been hospitalized since he sustained 2nd and 3rd degree burns while battling a Riverdale house fire on February 24. 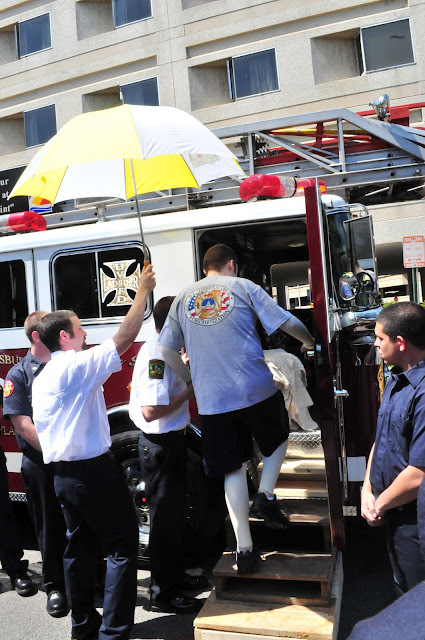 At about 1:30 pm, Kevin was brought from the Burn Unit of Medstar Washington Hospital Center downstairs where he stepped out of the wheelchair. He walked gingerly with his parents, Jeff and Jane O'Toole, Bladensburg Fire Chief Randy Kuenzil and Jason Woods from the DC Firefighters Burn Foundation. He greeted fellow members as they stood by Truck 809 and then he made his way to the microphone. Sergeant O'Toole was very gracious in responding to questions about his injuries, recovery process and future plans. Volunteer Chief Kuenzil and Burn Foundation President Woods also provided comments concerning Kevin's stay at the hospital and recovery. Prince George's County Fire Chief Marc Bashoor visited Kevin earlier in the day and wished him the best in his recovery process. 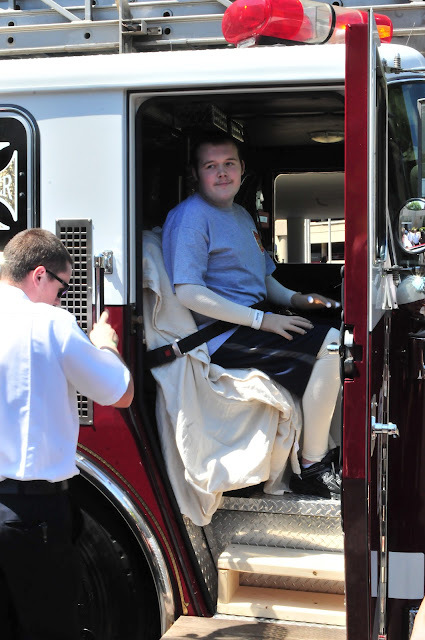 Kevin O'Toole boarded the front seat of Truck 809, the unit that brought him to the house fire where he was injured. Bladensburg's ladder truck, 2 engines and 2 chiefs buggies departed the hospital en route back to the Fire/EMS Station. He was greeted at the station by a host of firefighters from Bladensbueg and other surrounding stations. Kevin's return now closes the operational aspect of the call now that everyone has gone home. Kevin will join his parents as they travel back to Bethpage, New York in the morning. He will continue his out patient treatment and physical therapy in Bethpage. Bladensburg Volunteer Chief Kuenzil addresses media. DC Firefighters Burn Foundation President Jason Woods provides comments . Fire Chief Marc S. Bashoor and the Prince George’s County Fire/Emergency Medical Services (EMS) Department congratulate Chaplain Paul D. Brown, who on Saturday, May 12, 2012, at 10:00 a.m., will graduate from Virginia Union University in Richmond with a degree of Master of Divinity. Paul Brown has been serving as the Fire/EMS Department chaplain since 2007. His responsibilities as chaplain include, but are not limited to, helping members of the Department and their families in times of crises; responding as often as possible to emergency situations and providing assistance; and presiding over Departmental events and ceremonies, providing prayers of Reflection, Invocation and Benediction. Chaplain Brown is currently serves as Equity Administrator of the Maryland Fire and Rescue Institute in College Park. Congratulations and best wishes, Chaplain Brown. Chaplain Brown provides the Invocation at a recent Firefighter Recruit School Graduation. Volunteer Sergeant Kevin O'Toole is set to discharged from the hospital today. Kevin sustained 2nd and 3rd degree burns to 50% of his body while battling a Riverdale house fire on February 24. He has been in the Burn Unit at the Medstar Washington Hospital Center ever since. Kevin O'Toole and his family have been told he should be discharged sometime between 1 pm and 2 pm. Kevin can be soft spoken and does not relish the media spotlight. 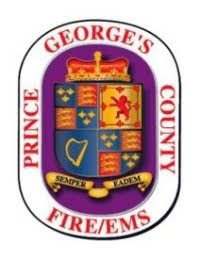 He has agreed to make comments to the media after he leaves the hospital and before he boards Bladensburg Truck 809, the unit he was on the night of the fire, for a return trip home, the fire station, to ceremoniously close the incident. Kevin will not address the incident itself and requests the media refrain from asking those questions. He will respond to questions about his injuries, treatment, support and immediate plans for the future.